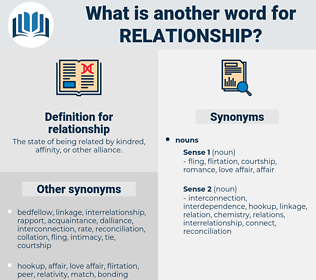 What is another word for relationship? The state of being related by kindred, affinity, or other alliance. considerations, hyperlinks, results, reviews, constructions, Publications, Dependencies, data, fences, CRS, media, links, reports. comparisons, Associations, bonds, dots, hyperlinks, terms, links, interlinkages, reports. kinship, data, interrelatedness, conjunction, respect, interconnection, collaboration, interlinkage, context, interdependence, relationship-building, correspondence, bearing, balance, partner, attachment, intersection, connectivity, connectedness, dealing, reports, synergy, agreement, dependence, constraint, subordination, marriage, encounter, interdependency. Referred, Compared, noted, addressed, stressed, maintained, Hoped, expressed, Came, Occurred, Was, applied, Dealt, said, added. relates, intertwined, correlated, established, Compared, involved, mediated, engaged, forged, listed, Arisen, committed, maintained, Dealt, drawn, satisfied, Weighed. relations, interplay, relational, links, ratio. relations, ties, partnership, partnerships, connections, relation, ratio, ratios, affairs, interaction. 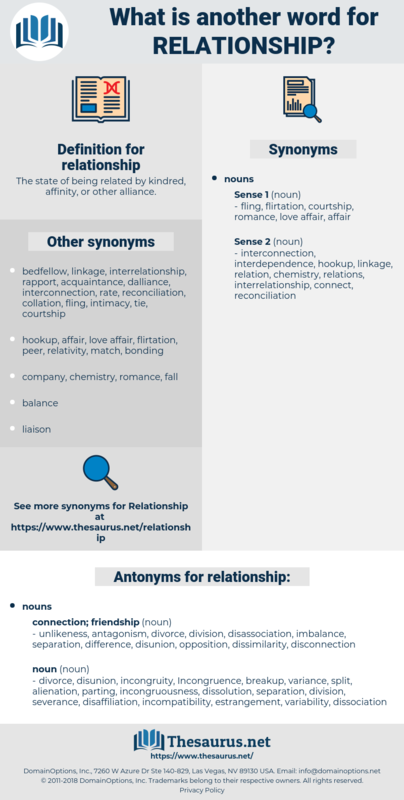 interrelations, liaisons, interactions, connections, ratio, ratios. relations, correlation, interrelation, interplay, interconnectedness, relatedness, partnership, attitude, acquaintance, articulation, links, relation, affiliation, proportion, ratio, disjunction, parentage, affinity, closeness, interaction. unlikeness, antagonism, divorce, division, disassociation, imbalance, separation, difference, disunion, opposition, dissimilarity, disconnection. estrangement, variance, dissolution, incongruity, incongruousness, alienation, breakup, incompatibility, parting, variability, dissociation, disaffiliation, severance, Incongruence, split. Maybe even have some sort of relationship, although he was in no rush. But he will not acknowledge the close relationship, he will deny his own children and declare they were sent to him by an evil fate. assimilation, business relationship, tie-up, friendship, love affair, association, acquaintanceship, friendly relationship, sexual relationship, tie, subjection, subjugation, anaclisis, acquaintance, account, membership, romance, affiliation.